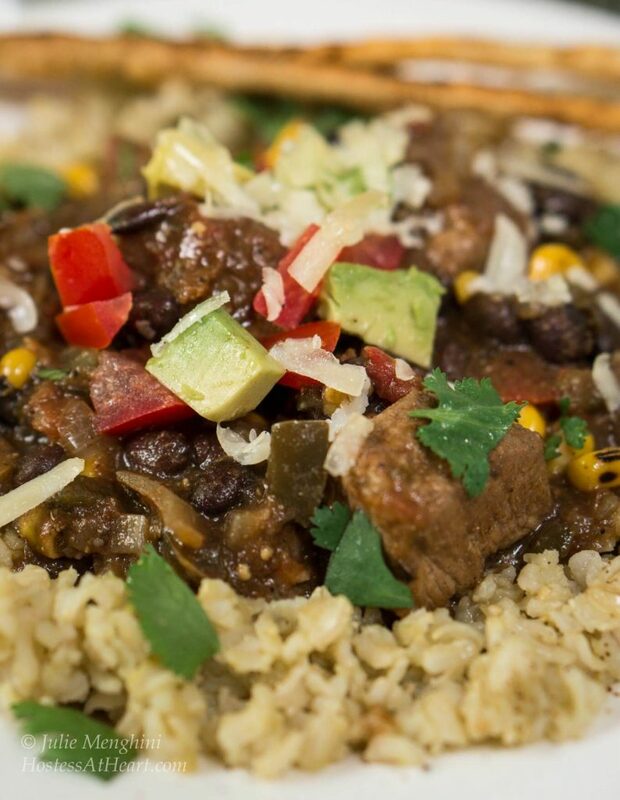 Poblano Pork Stew over Tomatillo Rice is rich in flavors and has a deliciously warm kick. It can be made in a crockpot or simmered on the stove. Either way, you’re going to love this dish. 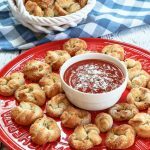 Make it fancy and serve it with Tortilla straws! This recipe was inspired by a can of tomatillos that I had in my cupboard. I bought these tomatillos for a recipe that I wanted to try. By the time I got around to it, I couldn’t remember where I saw the recipe. Do you do this? I swear I have kitchen ADD sometimes. I’d have so much more time in my day if I wasn’t backtracking trying to remember what in the heck I needed to do. I put this can to one amazing use, and I am 100% sure that they are just as delicious (or more so) in my Poblano Pork Stew over Tomatillo Rice than in the recipe that hasn’t resurfaced. I love cooking in layers and giving each step it’s own love and attention. It really makes a big difference when it comes to flavor. This recipe can be a little time consuming so you could put this recipe (minus the rice) in a crockpot and just let it cook away while you’re at work or chasing after the family. I served the poblano pork stew over tomatillo rice which came out yummy delicious, and some ancho tortilla straws, for one fancy looking meal. To make these straws puffy, you have to use uncooked tortillas. I love the TortillaLand brand (this is not a sponsored post). 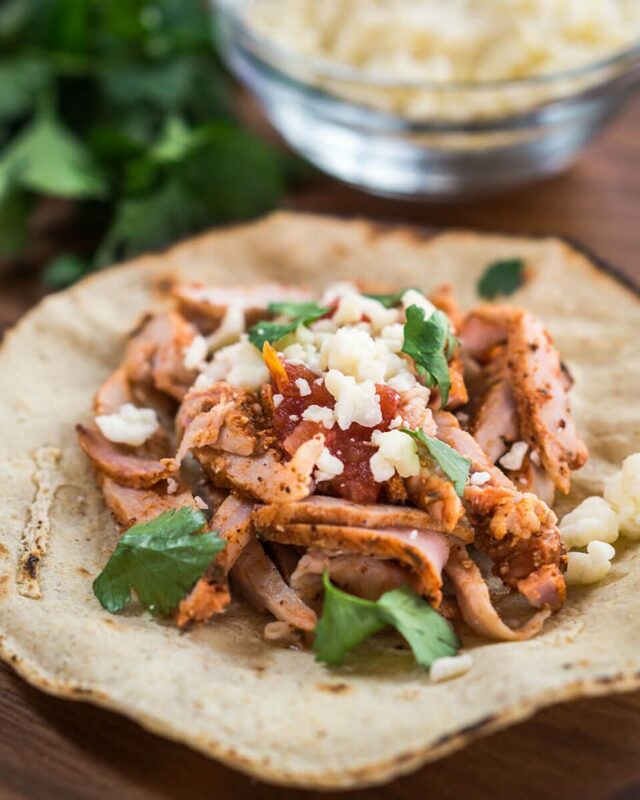 If you don’t use uncooked tortillas, you will have flat tortilla strips which are delicious and can be made the same way. 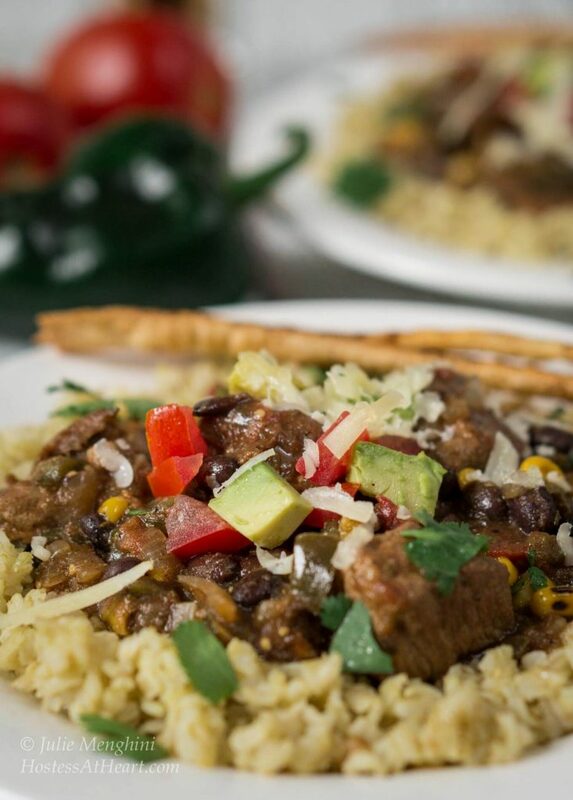 Poblano Pork Stew over Tomatillo Rice is rich in flavor and has a deliciously warm kick. You can make it in the crockpot or on top of the stove. Garnishes of choice such as avocado tomato, cilantro, cheese. Puree tomatillos with juice. Measure out 1 1/2 cups and set aside. Drizzle a large (7 - 9 quart) dutch oven or stock pot with olive oil. Heat over medium-high and cook cubed pork in batches. Salt and pepper each batch. Be sure not to crowd. Brown each side and transfer to a plate or bowl. Add additional olive oil if necessary and brown onions and poblano peppers (about 5 minutes). When slightly softened, add garlic, ancho chili powder, cumin and Mexican oregano. Cook until fragrant, about 1 to 2 minutes. Add pork back to the pan and add pureed tomatillos (*all but 1 1/2 cups) chicken stock (*all but 1 cup), and diced tomatoes. Salt and pepper to taste. Simmer for 1 hour. Add corn and beans and simmer for an additional 30 minutes. Add 1 1/2 cups pureed tomatillos and 1 cup chicken stock to a saucepan. Bring to a boil. Add rice and two teaspoons of butter. Cover and reduce heat to a simmer. Cook 35 to 40 minutes or until liquid is almost absorbed. Remove from heat and allow to sit for 5 minutes. Rice will continue to absorb liquid as it sits. Preheat oven to 400 degrees F. Spray both sides of each tortilla with non-stick cooking spray or brush with oil. Sprinkle with ancho chili powder and salt. Cut into strips (a pizza cutter works great). Place tortilla strips on an oiled baking sheet and bake for 5 minutes or until lightly browned. Serve Poblano Pork Stew over rice. Top with garnishes and tortilla straws. I want to thank that can of tomatillos for the inspiration to create this very delicious dish! If you’re still looking for a few more recipes with a Mexican flare here are some of our favorites! YUM! 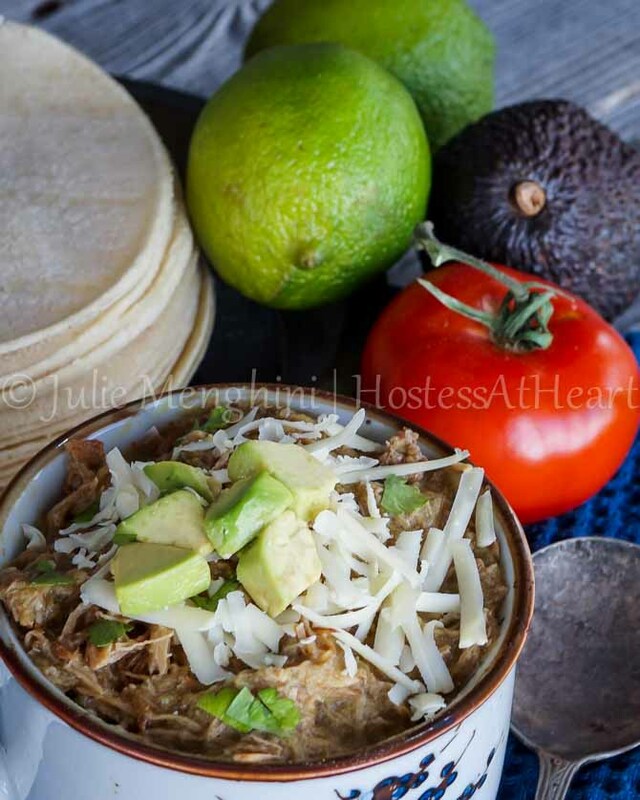 This POBLANO PORK STEW OVER TOMATILLO RICE looks so yummy and filling!!! Perfect for this weekend’s dinner! I made it again just two weeks ago for company and they loved it. We loved having it for leftovers during the week too! There isn’t anything about this I don’t love!! Pure comfort! 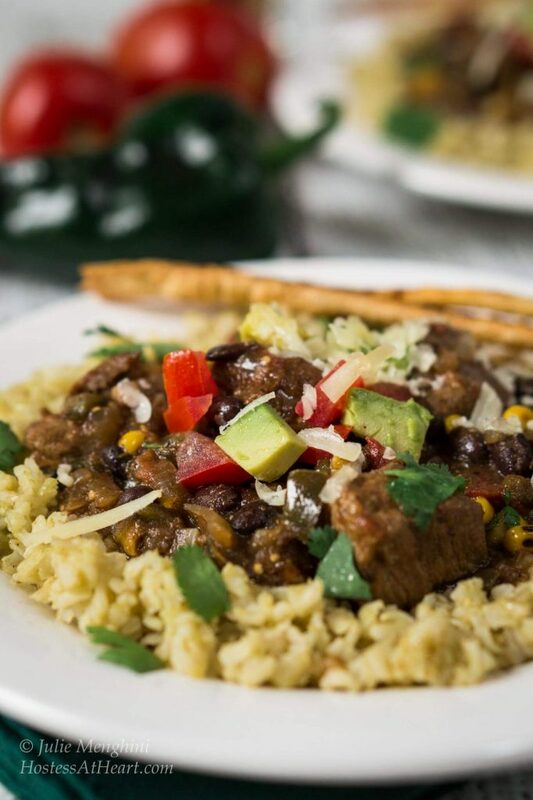 This stew looks amazing but that tomatillo rice is just genius! I am going to use that for everything now!! Thanks, Jen! It is so good and I’ll definitely be making my rice this way from now on. I wish the hubs liked tomatillos. He’s not a hugs fan of the tartness they can bring to a dish. I love them. This looks so good! I think recipes that use them like salsa are definitely an acquired taste. This recipe doesn’t have that tartness just that great Mexican combination of flavors. Oh my all of these flavors sound sooooo good together. And I have TOTALLY done the same thing, buying something for a recipe and totally forgetting about it! I have a jar of maraschino cherries in my pantry right now for the same reason! 😉 Can’t wait to try this one, Julie! It’s making my mouth water! Hmmm maraschinos would be a little harder for me? Thank you Ashlyn, we really loved this one! This stew looks delicious and sounds so incredibly flavorful! Thank you! I made this again yesterday and it was perfect for a spring snowstorm! Thank you Michele! I just made this and served it to friends on Saturday. She wanted the recipe and the leftovers! Layering flavors makes all the difference, that’s why I love your recipes! 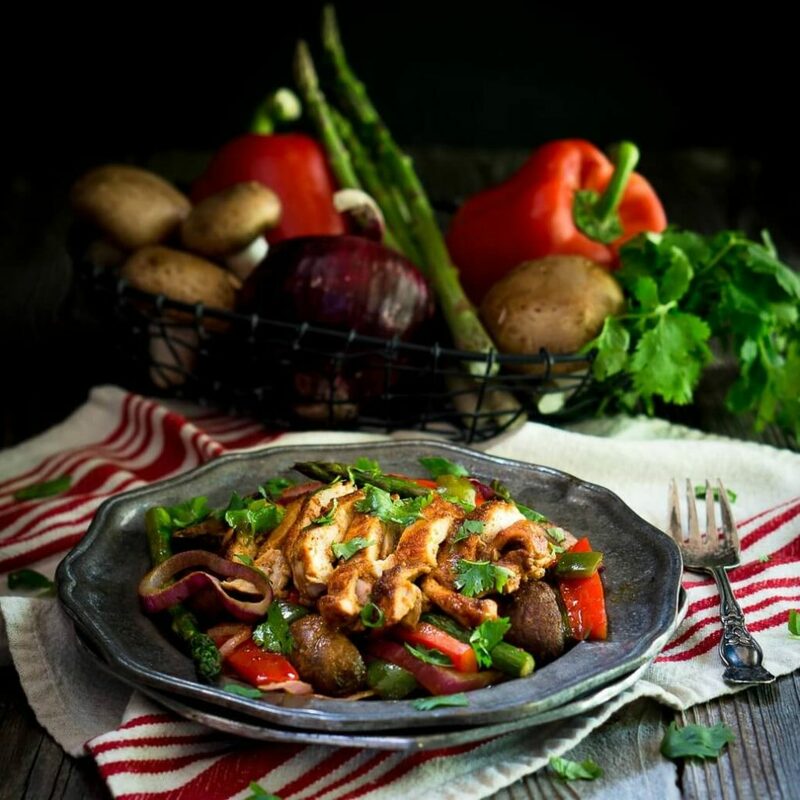 This looks just spectacular and I can’t wait to give this yummy stew a try! You are so sweet, Debra! 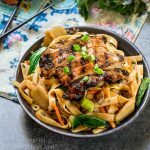 Oh and my #1 recipe for the year is YOUR Teriyaki Chicken bowl! Thank you Jennifer! I used canned tomatillos so I didn’t have to roast them! They say that cilantro tastes like soap to some people. Not me, I love it! Mmmm this looks so yummy! I love tomatillos – and I love anything I have the option to make in the slow cooker, because I’m lazy! I totally do that all the time, forget what recipe I wanted to make! Thank you Michelle! You are NOT lazy my friend. I don’t know how you do everything you do. Pure comfort food! Sounds super delicious and really easy! Those straws? I love ’em! So cute! Thank you Shadi! They were a special treat! I do that all the time Julie… I find items that were bought for something and have no idea what it was for…. but this sounds like a great success from a stray can! I especially love the straws you made! Im so making those very soon! Thank you Michele! I love when everything comes together. Wish I could say that was always the case. Not…LOL! Ooh, just love everything about this, that tomatillo rice and those puffy straws! I am also guilty of kitchen ADD, I have on more than one occasion bought ingredients for a recipe and then never made it. So you have me beat, because you not only used your ingredients but you turned them into something amazing! Thank you Meghan! It doesn’t always work as you know, but I was pretty tickled about this rice, and those straws were a pleasant surprise too. I’d made them before but not with the uncooked tortillas. Happy cooking Meghan! 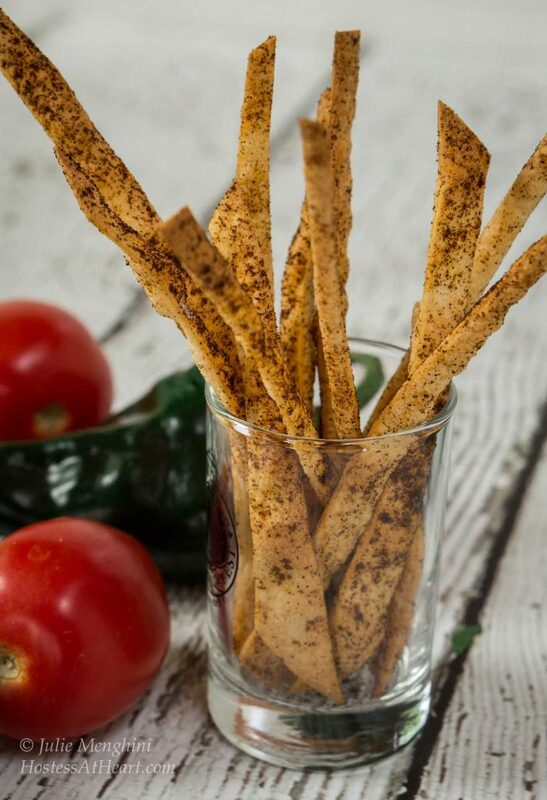 Not only do you give us an incredible recipe…but you share your tortilla straw secret. I feel so lucky to have this to try! Thank you Sandi! Sometimes the simplest things are the best. John thought I had cured the commmon cold when I set the jar of those straws in front of him. Such a kid that boy. Enjoy your weekend! This sounds delicious. I do the same thing as far as buying ingredients for a dish I want to cook, then forgetting where I put the recipe or even what I originally intended to make. You do end up with a lot of odds and ends to spur creativity such as this. Thank you Liz! I’m lucky if I remember why I walked into a room sometimes! I get so inspired and tear out magazine pages and end up with a file full of stuff that I never touch again let alone make. I am guilty of that one as well! I have file folders full of clippings. Looks great, Julie! And right up my alley with those flavors! Happy FF! Thank you Mollie! So sweet of you to co-host us this week. It’s a commitment that I enjoy but is still takes time so I appreciate you helping out too! Never having eaten tomatillos and knowing they are not available here in the Dordogne, could you suggest an alternative? Regular tomatoes? Nadia I’m not sure. To me they have a tart green taste. Maybe a green tomato with lime? They used to be just from Mexico but are easy for us to grow in the summer in the USA now too. Thank you Carina!I am very excited that you’ve joined me! I’ll be sure to pop on over and visit you too! Thank you Lauren! I really appreciate you sharing too! Love everything about each part of this dish. Thank you Ana! John really loved crunching on these straws. I’m making them again today for a salad were having at dinner. What a gorgeous dish! I love tomatillos! Thank you Sarah! We love them too and I was glad that the canned ones were delicious. Much easier than fresh for this dish. Lovely and hearty! I’ve made cilantro rice and green chile rice, but never tomatillo rice! Brilliant! Thank you Mimi! It was definitely a good experiment. I love green chile and cilantro rice too! How very pish posh with your tortilla straws Julie, that really set off the meal nicely! Loving all the flavors going on in your stew, I do have one question though. The first time I tried poblanos I fell in love with them, and my Mexican friend taught me to use tongs directly over the burner to char the skin, then cover it for a bit and peel the outer layer. She said it gave it that extra flavor, so I’ve always done my poblanos that way. So how did you use yours? By the sounds of it, just like green peppers? Don’t you just love the taste? I use them quite often now. I didn’t know tomatillos came in a can either. Educate us would you? 🙂 Love the rice flavors too. Great questions Loretta. I always charred my fresh tomatillos too, but wasn’t sure how the canned ones would work. It isn’t really possible because they are packed in juice. I just pureed them and their flavor was amazing. Those straws were so easy, and you would have thought I gave John $100 bucks. He just loved the crunch that they gave this dish. That rice was so good Loretta. 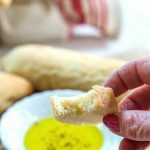 I have to say this recipe made up for a few of the fails that just didn’t ever make it to the blog. Hi Julie! This looks delicious! I love cooking in layers too. Although not so much on weekdays when I’m exhausted from work and want to get dinner done in 5 min haha. But it really does make a difference! I can’t find tomatillos anywhere so I’ll order some online and try this out! Thank you Ai! These were actually canned tomitillos! I bought them for a recipe and couldn’t even remember which one. Silly me! These are my absolute favorite flavors. Looks mouthwatering!! Thank you so much Josette! I finally got a pullman pan and have been baking bread in it! You were the one that told me about that pan. We love it. This just looks and sounds wonderful, Julie! I love all the ingredients. I didn’t know tomatillos came in cans either. I agree with you about layers of flavor. I love food where the taste changes while you’re eating it and you can detect a lot of different ingredients.. The tortilla straws are a really fun addition to the meal. 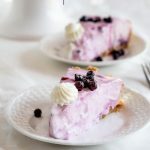 Definitely pinning this recipe! Thank you so much Shari! I love taking an ingredient and making something from it but other times it just sits there while I can’t remember why I ever bought it. That’s probably more the norm. You must have been Mexican in your previous life Julie! Another winning recipe. I never knew tomatillos came in cans!!!!!! Ha! I might have been? I had a psychic tell me I was here in this life time for get better at patience. He asked how I was doing. I had to tell him that I need more time! That’s hilarious Johanne! I really do love Mexican food! I’m on a greek food right now though. I guess I have a split food personality! Thank you Judi! It was so good, and funny thing is John just loved those little tortilla straws. Sometimes the easiest thing excites him. Love the colors, and I’m sure the taste is fantastic! Fabulous Julie, looks and sounds so delicous. Really love the tomatillos in the rice. Thank you Suzanne! That was definitely a successful experiment. It was really good.